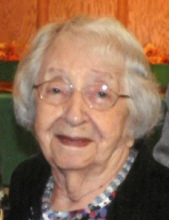 Anna Catherine Lechner (nee Metz) age 98 of Hartford, Wisconsin entered into Heaven on Sunday, September 9, 2018 at the Waterford of Hartford. Anna was born on September 29, 1919 in Rubicon, Wisconsin to Mary (nee Scholtes) and Jacob Metz. She was united in marriage to Glen J. Lechner on January 25, 1956 in Hartford. Anna had a great work ethic and often worked back to back jobs for many years as a waitress at Zivko’s Ballroom in Hartford, The West Bend Company, and Weinberg Shoe Factory. She was devoted to God and said the Rosary every day. She enjoyed reading, knitting, crocheting among many other crafts. She made many afghans, hats, holiday decorations that her family will cherish. She will be dearly missed by her family. They will also miss her good sense of humor. Anna is survived by her loving children, Jerry (Carmen) Smith of TN, Pat Darling of West Bend, John (June) Smith of Hartford, Charlotte (Leonard) Laufenberg of Iron Ridge, and Jim Lechner of Hartford; cherished grandchildren, Kimberly (Glenn) Nealley of PA, Tom (Erin) Hunter of West Bend, Deb (Ted) Lauren of Campbellsport, John (Theresa) Smith of Hartford, Joe (Gail) Smith of Hartford, Brian Peterson of Waupun, Marty (Heide) Peterson of TN, Julie DeJong of Oconomowoc, Brian Laufenberg of Beaver Dam, and Nick (Diana) Laufenberg of IL; also 28 cherished great-grandchildren and 14 cherished great-great-grandchildren. She is further survived by many loved nieces, nephews, other dear relatives and friends. She is preceded in death by her husband Glen Lechner; sister and brothers; son-in-law, Fred Darling; granddaughter, Carey Judd; and great-grandson, Jeffery Hunter. A Mass of Christian Burial for Anna will be celebrated on Thursday, September 13, 2018 at 11:00a.m. at St. Kilian Catholic Church (264 W. State Street Hartford, WI 53027) with Fr. David LaPlante officiating. Family will greet relatives and friends at the church on Thursday from 9:30a.m.-10:45a.m. In lieu of flowers, memorial contributions to St. Kilian Catholic Church (428 Forest Street Hartford, WI 53027) are greatly appreciated. The family would like to thank the staff at the Waterford at Hartford for their care and support. To send flowers or a remembrance gift to the family of Anna Catherine Lechner, please visit our Tribute Store. "Email Address" would like to share the life celebration of Anna Catherine Lechner. Click on the "link" to go to share a favorite memory or leave a condolence message for the family.